Do you wish the world around you was just a little more symmetrical? Maybe eternally washed in a candy-colored Instagram filter? Perhaps with a stronger Bill Murray presence? Basically, do you yearn for a daily life that looks identical to a Wes Anderson film? You should think about booking a trip to Budapest. Earlier this year, during Budapest design week, curators at NextArt Galeria teamed up with designers Zsuzsa Megyesi and Attila F. Kovacs from A+Z Design Studio as well as artist Geza Szollosi to lift Anderson's aesthetic from the screen to real life. Opting to creating an art experience far removed from the "white cube," NextArt installed its gallery's goods in a space crafted to mimic the set of "The Grand Budapest Hotel." The resulting lounge, a lavish medley of furniture, design, film and contemporary art, feels like a haunted version of Anderson's set, imbuing the famously twee visionary with an extra dose of darkness. 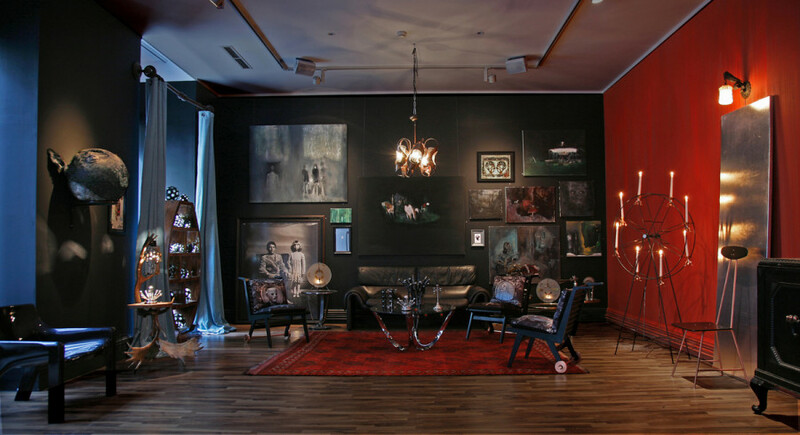 A+Z contributed the eerie design touches like the candle-holder and chandelier, while artists including András Braun, Tamás Dobos and Lili K. Fehéri submitted artworks equally ominous. Anderson buffs, eat your heart out and enjoy the unorthodox gallery experience below. Bill Murray not included.